Fact: Elementary students have regularly-scheduled library time every week. This time usually includes a storytime, booktalk, or other lesson, as well as time to browse and check out library books. No one disputes it. No one says there isn't time for library. This has been the case at every school I've worked at, observed, and attended back in the 1980s. Fact: In most middle and high schools, students go to the library for research lessons or when a teacher schedules her class. It's irregular and 100% dependent on the teacher scheduling the class with the librarian. Because library time is teacher-dependent, some students get quality library time while others get nothing at all. This has been the case in every secondary library I've observed, visited, and attended back in the 1990s. My question is...why is that? Why do elementary students get to enjoy library every week, but middle school students depend on their teacher to schedule time in the library? Why? In the past few days, I've seen three posts on LM_Net, a huge librarian listserv, from secondary librarians looking for strategies to encourage teachers to bring their students into the library more often. As a former teacher, I do not understand this at all. Why wouldn't a teacher, especially an English teacher, not actively work to bring his or her class to the library? Library time should be the first thing you schedule, not something you squeeze in if you have time. If you look at it that way, trust me, you won't have time. Possibly, the problem isn't with the teacher. Maybe the librarian is constantly pulled to sub or to cover the front desk in the office during lunches or office meetings. Perhaps the library is frequently closed for meetings or non-library events. Maybe the librarian doesn't really want to see classes, or maybe there is no librarian at all. I know these things happen far too often--some of these have happened to me as well. The purpose of this post is to encourage secondary librarians and teachers to work together to make regular library classes a reality. Consider the many ways the library can support classroom learning. Consider your students, who truly miss their regular visits that were a normal part of the week in elementary school. This post is not just lip-service to an ideal situation in an ideal world. I see all of my middle schoolers and three classes of high school students on a regularly-scheduled bi-weekly basis. I have them for the entire period--at my school, that's a full 60 minutes. I've done this for over seven years at two different secondary schools in two different countries. My current school has about 400 secondary students, and my Texas school had about 850 middle schoolers (yep, I saw all of them every two weeks). And yes, the library was open all day, every day, to any student who needed to checkout, read quietly, finish a test, work on an assignment, or to use a computer. We were open during all lunches and before and after school. The truth is, I have NEVER, not even one time, had an English teacher who didn't wholeheartedly support my request to teach their class one day every two weeks. I've never had to do much convincing, either, even when I was brand-new at the school and the teachers didn't know me at all. All my English teachers have been thrilled to bring their classes in. Are my English teachers--all the 30 or so middle school English teachers I've worked with over the past seven years--just the cream of the crop? Well, yes, I think they are pretty awesome. But so are your English teachers. Ask them about bringing their classes bi-weekly for a library lesson, and see if they don't say yes. So what do I do during my lessons? Everything! I booktalk like crazy. I teach the Dewey Caveman story. I let students practice using audiobooks. I teach reading strategies. We watch book trailers. We practice using our Destiny catalog. We write. We create Tellagamis and spine poetry and learn about our genre personalities and write the story of a pair of shoes. I read picture books from around the world as a way to booktalk novels and nonfiction about that region or time period. It is busy, but oh-so-awesome! Students and teachers love their library time, and when they have to miss a library lesson, the teacher and I work together to reschedule it. And this year, for the first time, I have three of my high school English classes scheduled on the two-week rotation. I was so excited to get some of the high school classes this year! I initially asked for this and was told that the high school English classes "didn't have time" for bi-weekly library lessons. These three classes were scheduled individually with the teacher, who is a huge proponent of the library. Yay! Meet with teachers in-person. Every school year, before school starts, I meet with our English Department all together. We establish that we want all middle schoolers in the library for lesson and checkout every two weeks. Be very clear in your expectation that the teacher needs to be involved in the lesson (not grading papers or checking email in a corner the whole time). This has been a source of annoyance for me many times. If a teacher continues to be actively uninvolved, I grit my teeth and carry on anyway. The greater-good is still served for the students, even though I know how much better it would be with an involved teacher. Establish that you will have the students for the entire lesson. Sure, you can be flexible if you can't get the time any other way, but the goal should always be the full lesson. If you are a certified classroom teacher, say that often. It's very common for teachers, students, and administrators to forget this important fact. I say "When I taught 7th grade English..." at least once every day. I'd wear a huge copy of my teaching certifications on my back every day if I could. If your English Department isn't responsive as a whole-group, pick a couple of teachers who might be amenable to library time. Give their classes some UH-MAZ-ING library lessons. The kind of lessons the students excitedly tell each other and their parents about. Word will spread; it always does. Take and display lots of photos of students enjoying the library. Display student work. The library should look like students actually use it. Keep track of stats. You should be able to track an increase in library visits and circulation numbers. No library aide? Even when I had one, she was regularly pulled to sub for teachers, often all day long. I trained my teachers to checkout books (they loved that! ), and I had eighth grade student assistants. I love and miss every single one of my eighth grade assistants, some of whom are now in college. My student assistants were absolutely invaluable to my library program. Train them well, and your students can be that, too. OH YEAH, THE TOP TEN! 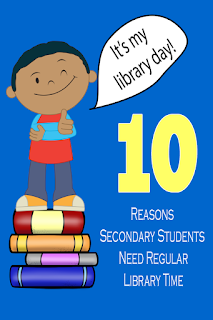 So I promised ten reasons why I think all secondary librarians should see students for a regular library time. These are time-tested benefits I've seen over the past 7.3 years as a secondary librarian seeing classes on a rotating bi-weekly basis. Yes, I am preaching to the choir here--if you are reading my blog, you are probably either a school librarian or a teacher who loves the library. I give you these ten reasons to support your efforts to regularly see all your students for fun library lessons. To support teachers who want to give their classes more library time. And most definitely to tip over anyone (librarian or teacher) who might be "on the fence" about it. 1. Circulation will go up. A lot. This comes from a ton of booktalking and from the students simply being in the library. Many students would check out books if they were given a specific time to do it. Two minutes between classes or four minutes at the end of lunch is not sufficient time to really explore the library. Will some students still waste this time? Of course they will. That's one reason why the teacher really needs to stay with the class. The teacher knows her students and their reading levels far better than I do. If a student isn't using time wisely, the teacher can redirect the student and possibly help him or her find a new book. If lots of students are abusing the checkout time, the teacher can take anyone not checking out back to class if needed (this has happened in my library from time to time). 2. You will collaborate with the teachers, organically. Library lessons are a natural time to informally collaborate with the English teachers. I get to know my English teachers well because they are physically in the library for a full day every two weeks. We talk about upcoming units and how I can help integrate them into library time. We talk about books we've read and what we are doing on the weekend. We talk about students and what we could do to help them become better readers. It's truly an awesome thing when librarians and teachers make time to simply talk. 3. You will see students you would not otherwise see. For a whole host of reasons, some middle school students won't make time to come to the library on their own. Middle school is prime time for students to decide if they "like reading" or "hate reading." If you see these students with their English class regularly, you have a chance to be a part of this decision. Be that voice. 4. Your students will love it. In both my secondary libraries, I had students come in every day and say, "is it our library week this week?" When I say "Why, yes, it is!" the students are so happy. They fist-punch the air and say "Yes!" or tell their disbelieving friend "See, I told you!" And when it isn't their week, their faces fall. They are so sad it's not library day. 5. Your students will appreciate the break. Library is fun, and the students know it. I can remember being in middle school and loving the few days we went to the library for research. It was ALWAYS for research (I don't remember getting one booktalk from our two middle school librarians), but it was still fun. I got to sit with my friends, and it was much more relaxed. I got to listen to a different teacher with a different style. It was a different location. It was awesome! 6. Your teachers will appreciate the break. Just like your students, your teachers will love a change in scenery. They'll be thrilled to allow someone else to take over for a little while. They'll love unlimited restroom breaks, any time they want to go. They'll love enjoying their coffee in the library before it sits so long it goes cold. 7. Your students will remember the library after they move on. Do you remember what your middle school library looked like? How about high school? I ask this because I really do not remember either of mine. I do remember a Christmas tree in my middle school library, and the fact that the library was often used as a pass-through to other classes. That's really not much to remember after I spent four years there. I still remember my sixth grade locker combination (Locker #3283, combination 6-23-42) and all of my teachers' names all the way through school. At age 41, I can still write down my schedules for each school year, probably with at least 90% accuracy. And I certainly remember my elementary library, the librarian, and even some of the stories the librarian read to us. I remember our book fairs and Ms. Amy the parent volunteer and where the "big kids" section was and the water fountain right outside the door and where we lined up to leave the library. Obviously, the problem isn't my memory. And my high school library? I seriously remember NOTHING. I cannot picture one thing about my high school library because I do not remember ever going there. For a kid who loved reading as much as I did, why might that be? I read all the time, but I don't remember ever checking out a single book from the school library. Why didn't I ever go? Why didn't my teachers take us? I guess they just "didn't have time." I read tons of books in high school, but all of them were either purchased by me or borrowed from friends or the public library. If your students go to the library regularly, they will remember the library. They will remember you. They will reach the ripe old age of 41, and they'll remember going to the library because they went there often. If they remember the school library fondly, they are more likely to make new memories for themselves and their children at their local public library. 8. Your students will see the library as more than a place to do research. How many movies portray the library as boring, quiet, empty places? How many movies (or even books!) have portrayed the school library as so dead and boring that students could go there and pretty much get away with skipping class or making out with their boyfriend or girlfriend? I've visited many public libraries in different states and even different countries. Not one of those public libraries was empty or even all that quiet. And I've never seen a corner so quiet that people could make out long enough for anything more than a quick peck on the cheek. So where does this stereotype come from? Clearly, the people putting the movies together haven't spent much time in modern libraries. There's so much going on in libraries: storytime, computer use, adult education classes, people killing time, reading the newspaper, reading to their children. Libraries are far more than dusty places to do boring research. Even here in China, libraries and bookstores are both well-used places with plenty of people choosing to go inside. If your students only come to the school library to do research, why would they think it was anything other than a place for research? Why would they ever think the library could be a fun place, a relaxing place, a place where they are welcome to work or read or do absolutely nothing at all? 9. Teachers, administrators, and students will see you as the TEACHER that you are. Even if you are not a certified teacher, if you are teaching classes regularly, you ARE a teacher. Surprise! And if you are a teacher, you are not someone who simply shelves books and scans barcodes all day. You are a collaborator. You are incredibly valuable to your teachers, your students, and your school. You have a voice. Pulling you out of the library to sub or answer phones in the office or administer a make-up test becomes a whole lot less likely if administrators know you are teaching classes you planned with the teachers. It may take time for people to come around, but trust me, good administrators who pay any sort of attention at all will see you as a teacher if you serve in that role. 10. It helps reduce the number of overdue and lost books. Classes that come every two weeks have a constant reminder about overdue library books. I don't have to track students down months after a book was due to find out what's going on. I simply wait for their class to come into the library, then ask them about it right then. If, as in so many cases, the book has been sitting in their locker for the past two months, I just tell them to go get it now. The odds of my getting that book back in a timely manner go up significantly when I don't have to track anyone down to get the book. So that's it! Ten reasons I think every middle school (and yes, even high school if you can convince the teachers) should have regular, rotating, predictable library time. This time should be sacred, and the teachers must be involved in every library lesson, even if it's just to sit and listen. My best classes are the ones where the teachers simply pay attention and participate. What is your secondary library schedule like? Do you see classes on a regular, rotating basis? Do you have the classes long enough to do a proper library lesson? ;) You are so welcome! I hope I don't sound too preachy here, but I really do not understand why elementary kids get to have all the library fun! It is very sad, my 3-5th grade teachers have to choose between computer lab and library. So my kids are only getting to come every other week, if they don't miss, or just once a month if they miss. I just want to cry when I think that they are missing out on so much! Oh, Colette, that is so sad for them! Is there any way this can be changed? Poor kiddos are surely very sad to miss their library time. I'm subbing for a class right now (but in the library, and it's my own homeroom), and they are VERY EXCITED that they get to be in the library this morning and for another class later today. Best Friday ever! I am a full time librarian at a K4-5th grade elementary school. For the last two nights we've had parents & teacher conferences and when that happens I get siblings of present students coming over to check on me or hang out at the library. One of the most complaints I get from sixth graders is that they don't have library time and do not check out books. [They also complain about the amount of homework, but I tell them they will just have to get used to it.] This has been going on for as long as I can remember but this year I decided to coach the kids to ask for time to go to the library, meet the librarian, and ask for specific titles. I spend seven years with my students developing lifelong readers and it is disheartening to hear they cannot visit the library at their new school. Thank you for posting this here. I will post a link to it in my Biblioteca page on Facebook. I hope it is ok.
Mayra--I think you said it perfectly when you talk about how you spend seven years developing lifelong readers only to have the students miss out on library time in middle school. And yes, of course you can link the article on your Biblioteca page! Hopefully, it will inspire people to make some changes to their library schedules. This is wonderful! Thankyou so much! Your post served to remind me of all the fabulous things we get to show the students (the booktalks, the storytelling, the research, booktrailers, etc.). When you lay it all out, wow, I want to go back to school and be in my library class...lol. I am in a 4-6 school and I have weekly library classes and I love them. Thanks for inspiring all of us! Yay! So happy to inspire! I agree! I know the trend is to push for fully flexible scheduling, but I believe a hybrid of fixed LA classes and open slots for collaboration/research gives me the best opportunity to promote reading and my library programs with all students. Best of all, I see every student in the school and feel like I know them so much better and get a much better feel for what they might like to read. With 1200 students, I usually only see kids for half the period, every other week. However, I extend lessons as needed and see them during collaboration times as well. I really get to know the LA teachers and am able to tailor mini-lessons to what I think will align with their classes. Also, this gets EVERY kid in, not just the ones whose LA teacher thinks to schedule or who love to read. It makes for a really full schedule but I love it! I have done it with and without a Library Assistant and it works. Lessons are richer and more elaborate with an assistant, but either way is doable and benefits the students. Yes, it is totally doable, and I love how you emphasized EVERY kid. They all need regular library time--there are many who will not come in on their own. Great post! I'm inspired to do even more during library lessons. I'm a middle school librarian who sees every English class every two weeks, and I like that I get to know the students and do book talks. I'm realizing how much more that I can do during library lessons to make it more engaging and fun! Thanks for this post. It's a little daunting as I'm not a qualified teacher, nor a librarian so my ideas are a little lacking, and therefore I'm intimidated by the idea. Keep the ideas coming please! I got the job because I've worked with books, esp children's books in retail for years, and have had my own kids go through the school. Love my job! Do you ever read to the older classes? How do they like that? Hi, Rose! Any reading you do with older students needs to be started and completed in one lesson. It does not work to read one day, then continue it in two weeks. No one will remember what you read. If you want to read with them, try picture books for older readers (I have some ideas on my site) and do some sort of extension activity with it. I love reading a picture book then doing a related book talk. Good luck to you--it's daunting now, but you'll never go wrong by enthusiastically sharing your love of reading with your students. Thanks so much! I will start by sharing your blog with the English teachers...I know they're going to say there is no time for bi-weekly lessons, but if we could at least do once a month. Wish me luck! Hi, Margot! I love your statement that reading is not just required for study. My school has lots of students from Korea and China and other parts of Asia. They are VERY motivated academically, but reading for pleasure often just doesn't occur to them. I think it's a cultural shift that is changing, but slowly. Students often ask me for "classics" because that's what their parents tell them they need to read, not necessarily what they want to read. My school does not have a functioning library, so I am sure my students have time each week to spend in my classroom library. Hiya, Abby! Yes, this is the sad situation for far too many schools these days. I am happy to hear that you do have a classroom library for your students to use--I am sure your students use it well! This is such a great blog post. I agree completely For 10 years I had every-other-week library visits will all 3 grades of my middle school ELA students, beginning with a unique orientation customized to each grade level. The secret to promoting this kind of collaboration is finding a lesson in the ELA curriculum that can be better by doing it in the library, and then taking a written lesson plan to the teachers that thoroughly lays out their lesson as a library visit. Teachers appreciate that we are doing a "required" lesson that is so much richer and more meaningful through collaboration. Hear, hear, Barbara! Collaboration is critical, as is teacher participation in the lesson. It drives me nuts when I plan this awesome, curricular-aligned lesson, and the teacher just sits in the corner and grades papers or talks to another teacher the whole time or checks email. I get it--there is a ton to do as a teacher--but valuable library time is not the right time to do that. I am a 9-10 high school librarian in Texas and I see every English class every 4 weeks for book trailers, updates on research tools, browse, checkout books, etc. I get to know all of the students (approx. 1100)and have seen the same results as Mrs. Readerpants noted above in her Top Ten. My first year I was able to get the 9th grades English teachers on board and the following year, the 10th grade English classes joined. Teachers from other subjects can also schedule times for me to teach lessons as needed to their classes. Coming from an elementary library, I didn't want to give up that time, connecting with students regularly. It has worked beautifully. Great work, Debbie! I know your high school students appreciate it and enjoy their library time. And, unlike me, they will remember what their high school library looked like! What is Tellamagis? I Googled it and came up with no results. Thank! This was the boost I needed! I'm a TL at a high school and I can't get teachers to give a 5-question in-class survey, let alone anywhere close to scheduling regular library visits. It's probably though that they're not seeing the true value in what I can offer. I'm going to really push this next semester with my classroom teachers. My circulation is the lowest it's been in the history (albeit less than 10 years) of this school. It's time to get to work. Thanks for the insight! I am currently in an upper elementary school, but would like to get into a middle or high school in the future. Could you send me a sample of your schedule? I am interested to know if you meet with classes every week or if you have a week with classes and then a week without classes and so forth. Thanks! Happy to help, Ashley! If you will send me an email to leigh[at]readerpants[dot]net, I will send you my schedule. Man did I need this article! I'm going to implement some of your suggestions next year and I know we will all benefit from having a library that is better used. Thank you!